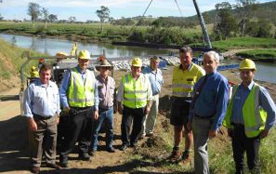 Somerset Council has installed a steel Unibridge as a temporary measure to replace the Alf Williams Bridge over the Brisbane River at Gregors Creek which was destroyed in January’s flooding. The temporary bridge restores a vital economic and community link for Somerset. The bridge will have a load limit of 25 tonnes and will have a total installed cost of more than $450,000. The bridge is expected to be reused as the new permanent bridge at Maronghi Creek near Harlin which was also destroyed by flooding.